THE VICTORIAN Peace Network (VPN) has been meeting every week to promote the setting up of local groups and coordinate Melbourne-wide activities. Delegates from churches, unions and activist groups have been attending with around 30 attending recent meetings. Regional groups have started up in Wodonga and Geelong and initial steps have been taken to try setting up groups in Gippsland and Ballarat. In Melbourne there are local groups in Darebin-Moreland and Western Suburbs. The next major rally will be on the weekend of the 15-16 February, but a definite place and date has yet to be determined by the VPN. Posters advertising a rally the day of a US attack on Iraq have been put on the www.vicpeace.org website and a public meeting is likely in the New Year. The first VPN meeting will be at 4pm, Tuesday 14 January. Affiliated groups can send a delegate. ANTI-WAR activists at Sydney University have set up a Students Against War (SAW) group to build anti-war activity in the summer break. The group was set up by members of the Free Palestine Collective and the Refugee Action Collective. SAW organised a successful screening of the documentary Berkeley in the 1960s, which looked at how the radical student movement in the US linked up with the movement against the Vietnam War. Fifteen people attended and agreed to convene again. ON 8 December up to 800 people marched in Perth against Howard’s support for war on Iraq. The march and rally was initiated by the NOWAR Alliance-a coalition of socialists, Greens, Democrats, and other activists. Speakers included representatives form the Islamic community, Greens, Christian Churches, the Medical Association for the Prevention of War and the Socialist Alliance. A key speaker was Carmen Lawrence who had resigned two days previously from the Federal Labor Party cabinet over the party’s stance on war and refugees. She said that it was necessary for ordinary Australians to stand up to politicians and cited statistics that in modern wars the number of civilians killed approached 90 per cent. Participants included contingents from the Maritime Union, the Refugee Rights Action Network, Labor for Refugees, and the Bassendean sub-branch of the ALP. Many Muslim people marched at the rally after attending a rally against the ASIO’s raids on the homes of Perth Muslims. LOCAL ACTIVISTS in the Marrickville area have combined to form the Marrickville Community Peace Group. The group is composed of people from the Greens, Socialist Alliance, the local Catholic Church, as well as several from the local Italian and Greek communities. The group has held regular meetings on Thursday nights and marched as a contingent of more than 50 from Newtown to the 30 November walk against the war. kids have you killed today” there was a real anti-capitalist flavour. Several Reclaim The Streets activists carryed a “Kentucky Fried Children” banner complete with imperial Colonel Sanders and red and white striped corporate logo. The group will show the John Pilger Film Killing the Children of Iraq, at the next meeting 7pm, 16 January, St Joseph Parish Church, 109 Lennox Street, Newtown. The group also intends to target a local military company that has large defence contacts with the Australian government Sikorsky Aircraft. The protest will be on Saturday 1 February. Assemble midday at Newtown bridge. THE IPSWICH Network Opposing War and Racism (NOWAR-Ipswich) group held a successful rally and march on Saturday, 30 November. Rashida Joseph, a refugee support worker, told the rally “We need to show the US and Australian governments that we will not stand for this devastation of humanity”. Other speakers included Father Ott a local chaplain, and the president of the Queensland Teachers’ Union Julie-Ann McCullough. The following week on World Human Rights Day, NOWAR-Ipswich hosted a meeting in a local restaurant about the personal stories of refugees. An Afghan TPV holder and two refugees from Laos discussed with about 20 Ipswich people the circumstances which led to them having to flee their countries. NOWAR-Ipswich is now focussing on 15 February and will look at building a concert for peace. NOWAR-Ipswich has also called for protest at 5.00 pm at D’Arcy Doyle Place in the event of bombing on the people of Iraq. THE QUEENSLAND Peace Network is holding its first meeting as Socialist Worker goes to press to discuss an action on the weekend of 15-16 February. The first meeting of the Stop the War Coalition will be 13 January. An emergency rally will be held in King George Square at 5pm the day of an attack. MORELAND PEACE Group, in Melbourne’s inner-north, met on 15 December. The 19 activists agreed to organise a picket in the new year of local MP Carlo Carli in protest at Labor’s proposed “anti-terror” legislation. As a representative of the Muslim community told the meeting, Muslims were already suffering harassment. The new legislation would give a boost to racist attitudes. The meeting also agreed to put on a showing of John Pilger’s video showing the impact of sanctions on Iraq, produce a banner and badges (with the slogan “No crusade for oil”), and hold street stalls. The group will also be publicising rallies in the city when the bombing begins, and on the weekend of 14-16 February. The next meeting will be on Sunday, 5 January, at 4pm at the CERES caf, Lee St, East Brunswick. For more details, ring 0408 619 152. 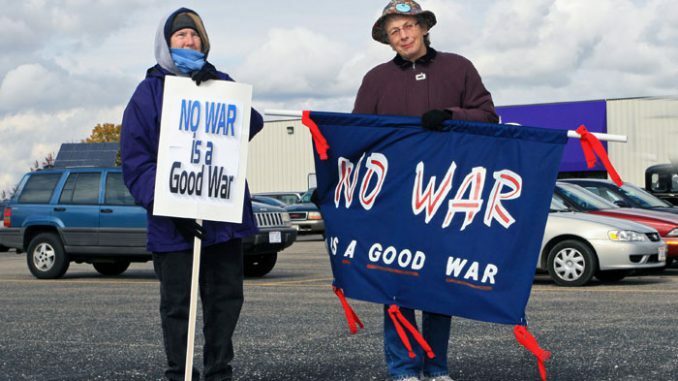 NORTHSIDE NETWORK Opposing War and Racism (Northside NOWaR) members are already gearing up to build the anti-war movement in the New Year. On 22 January the group will host a video screening of Berkeley in the Sixties, the inspiring story of the anti-Vietnam war movement in the US. The screening will help generate local publicity for the upcoming National Weekend of Action but will also draw out some of the lessons of how a superpower can be beaten. The idea of holding a picket outside of Howard’s Kirribilli residence when the bombing begins has also been raised. In the lead up to the 30 November rally, local activists were part of a speak-out against the war in Manly Corso. Among the speakers were Greens and Democrat MPs as well as speakers from Northside NOWaR, the Islamic Council and Socialist Alliance. More than a hundred attended and hundreds of posters and leaflets were distributed. AFTER THE successful 30 November demonstration the Walk Against the War Coalition has set down Sunday 16 February for the next major demonstration. There will be a rally at midday in Hyde Park north. The next meeting on 20 January will finalise march routes and speakers. There has been debate about whether or not to have politicians speak at the next rally. There were no parliamentarians on the speaking platform at the 30 November rally. Socialist Worker supporters are arguing that opposition to the war is gaining political expression with Carmen Lawrence resigning from the front bench of the ALP and the Greens winning the recent Cunningham by-election. It will benefit the anti-war movement if more parliamentarians speak out against the war and particularly if pressure is put on Labor. The coalition has also agreed that leaflets for future rallies include “ten reasons to oppose the war” arguments. There are weekly Friday night vigils for peace at Town Hall and there will be emergency rallies at Town Hall the day of a U.S. attack on Iraq and the day that Howard recalls parliament to discuss a war.